When I heard that a cow had gone viral I thought this could be no good thing; I’m not vet but memories of foot and mouth loom large. 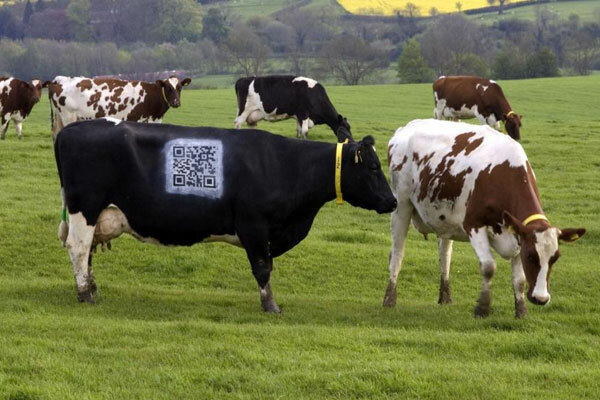 However this time it is all fun and games as a dairy cow has had a QR Codes painted on her side as a web link to ‘her’ blog. The blog contains details of her daily routine, which is interesting even if a little unsurprising. The cow is not just a very talented self publicist but is part of a campaign by the UK Dairy Industry to raise their profile. Although personally I preferred it when they sponsored ‘The Milk Race’ – the UKs ‘equivalent’ of the Tour de France. I don’t have much of an opinion on this but since this is a blog and banal opinions seem the order of the day when I get going I will share one with you anyway. This is a clever stunt and has made several news sources, maybe on a slow news day but still it does the job. However the really clever bit is in just how cheap it is, QR Codes are generated for free and then the programme to read them is also free (such as ours for android!). Just make sure you aren’t paying millions to a marketing agency before you start since it really is very simple. Everyone will have faced big problems or big projects in their line of work, the sort of problem which at first seems insurmountable. However these issues which seems to have no easy answer are often best solved with the simplest of solutions.Take for example Monday’s post about charities using QR Codes to generate extra revenue from people without cash, it didn’t need hand held card machines, simply used the technology everyone is already carrying. Therefore I was unsurprised to see that the Egyptian elections had been making the most of barcode technology. Since they are holding what are considered the first free and fair elections in their modern history there is no precedent to work from, no template. Using barcodes they are able to quickly ensure that the national identification cards match up with the lists they have. I am well aware though that you are probably not reading this seeking advice for running elections in a newly democratic country (and if you are, I’d keep looking!) but the point remains the same for other complicated projects. Keep it simple. Systems work best when everyone understands them and when there are checks in place to avoid human error, barcodes can offer both of these things. So if you are looking to simplify or increase efficiency then check out our website. If there is one industry which has to continually innovate it is the charity sector; often the first to feel the hit of an economic downturn as people feel they can be less generous with their hard earned cash. Therefore they are always quick adopters of new technology to optimise their income, the less money spent publicising the more money they can reserve for the real work. In recent years the Salvation Army and homeless charity Simon on the Street, among others, have used QR Codes to direct people to an optimised payment page where a donation can be made. So if someone simply has no cash on them it is no problem for the collectors! What is more QR Codes take almost no investment to introduce, they are easily made for free and only cost as much as the paper they are printed on. It is also worth remembering that the application required on smart phones for reading the QR Codes is freely available and most owners have such technology. We have our own freely available QR Code reader available for Android Phones which can be found on Google Play. Fore more information on QR Codes check out our knowledge base.